Today was a big day for the students in the STEP literacy course, Matthew and Jecobeth (who you met in an earlier post) included. For the past two weeks we have been working on first writing stories in tok ples (the local language) and learning how to edit them. Then each language group chose stories to put into a book. They drew illustrations, and then they copied both stories and drawings carefully onto stencils, because these books would be silk screened. Yesterday and today we did the actual silk screening of 15 copies of each book, and then in the afternoon we collated the pages and bound the books. There was quite a buzz of excitement around the room as each language group saw the final product of all their hard work – literacy materials they could take back to their communities. Research has shown that in order to become a fluent reader of a language, you have to read about 800 pages of material. Practice builds fluency. But what do you do if there simply aren’t 800 pages of printed material in your language? 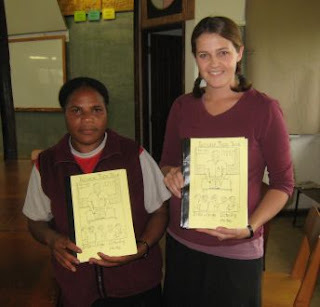 This is the problem that many language groups in Papua New Guinea face. So an important part of the STEP course is to develop writers, and more importantly, people who can teach others to write. These simple, hand-drawn books of short stories are a good place to start. Why do we teach them to use silk screens instead of computers? It’s time-consuming, and the result isn’t as professional. There is no spell checker. One of the main reasons is that in many places in Papua New Guinea, computers just aren’t feasible yet. Either there isn’t electricity, or the sheer cost of buying a computer and printer is too much for a community to support. 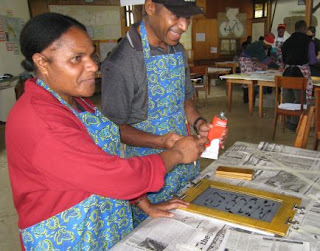 For a fraction of the price, however, a community could buy the materials needed to silkscreen books. However, the staff recognizes that computers are the way of the future, so all of the students are also taking basic classes in how to operate a computer. But silk screening gives them something to fall back on, and it can be a lot of fun too. Hey guys, I just read your "Field Notes" and really enjoyed it. In reading it I became aware of how great an impact you guys are not only having in PNG, but the impact you are having on us others back here in the states. I praise God that you guys are keeping safe and getting a lot of work done. Thank you for all your updates and new information, as well as the inspiration you provide me. I love hearing every story! I will continue to keep you guys in my prayers. Keep up God's awesome work. What is Valentines Day with out chocolate?